Harvested (picked?) 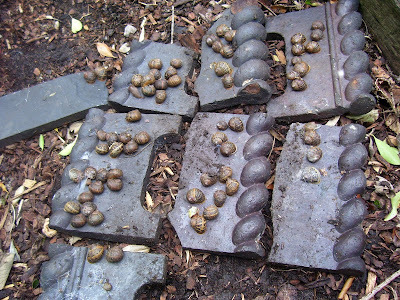 from a pile of slates in a wooded, but still inner-city (zone 2) garden, these snails were delicious. Kept in a bucket and fed on salad trimmings for five days they purged all the grit accumulated from their natural diet. Then they were fed for two days on white bread. The bread passing through the snails and staying white, tells you the purge is complete. Boiled, rinsed and boiled again (approx. 10 changes of water) until the slime and froth were gone. Simmered for an hour. Baked in parsley, garlic and butter. Sitting at my desk dreaming of the next time I’ll light a little fire for a brew and sit by the estuary, watching a cork float pull out into the current, carrying it’s cargo of Ragworms out to the fish. Or when time and tide permit; making the steep walk through the park, and down to Fairlight. Where I can offer a splashing, spitting YoZuri topwater lure to the Sea Bass as they patrol the weed-strewn rocks. In the meantime I, like suburban fisherman the world over, have to settle for the sad truth. I don’t so much go fishing, as collect fishing equipment. And it’s justified. Really it is.